MAP & UNIVERSE uses walking and story telling to explore the idea of perception and being lost. The courtyard at Brunåkra, an 1889 farmhouse in Gislöv, Sweden, was revealed through weeks of weeding and soil removal, and a labyrinth was built within the old stone patterns using polished stones from the nearby Baltic Sea. 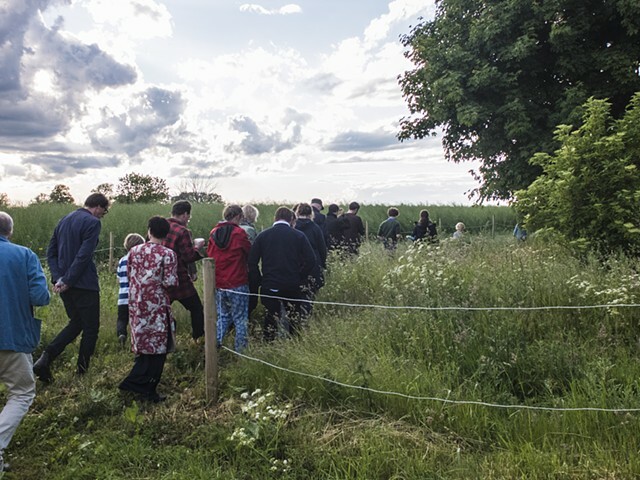 At the reception, participants walked the periphery of the farm, entered the central courtyard and walked the labyrinth, then traded stories about being lost. Created while in residence at Brunåkra, in Gislöv, Sweden. Special thanks to Brunåkra, to students from the Österlenskolan in Simrishamn, and to all the storytellers.